“You sing about your bonnie Scotland and your heather hills. It's not your bonnie Scotland. It's not your heather hills. It’s the landlord’s Bonnie Scotland. It’s the landlord’s heather hills. And if you want enough earth to set a geranium in, you’ve got to pinch it”, J.L Mahon cried out. 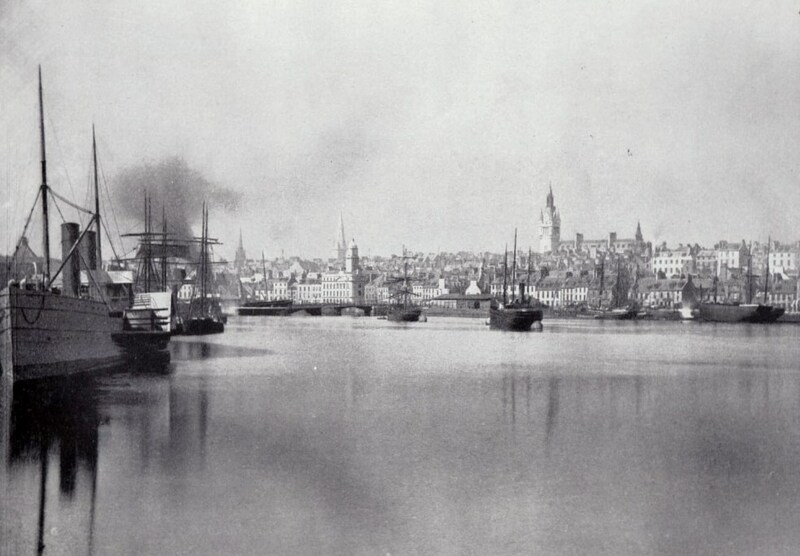 Mahon was a socialist who visited Aberdeen in autumn 1887 and started a series of open air meetings. He was arrested the following day for daring to speak on a Sunday. He was acquitted and the resulting publicity helped in the setting up of the Aberdeen Socialist Society, a branch of the Scottish Land and Labour League. This had been founded by the Austrian socialist Andreas Scheu with Mahon in 1884. At first it was affiliated to Hyndman’s Social Democratic Federation but, under the influence of Scheu, sided with the Socialist League when it broke away as a result of the autocratic behaviour of Hyndman. James Leatham (1865-1945), a local compositor, had invited Mahon to Aberdeen. He himself had been introduced to socialism by Alexander Webster, a Unitarian Minister in Aberdeen. Leatham was responsible for setting up the first openly socialist newspaper, the short-lived Workers’ Herald in December 1891. Leatham was very much on the social democratic wing of the movement, but there were others who joined the Society who took a more radical and anti-parliamentarian line. One of those who took this road and who joined the Socialist Society around this time was Henry Hill Duncan, the son of the Radical shoemaker Alexander ‘Sandy’ Duncan, and a shoemaker himself. Sandy Duncan had acquired some local fame for his systematic heckling of political and municipal meetings. Henry was born around 1862 and is referred to in accounts of the period as either H.H., Henry or Harry Duncan. Like Leatham, Duncan was first introduced to the socialist movement by Webster, having for a while been a leading member of the Unitarian congregation. Duncan served as delegate of the Boot and Shoemakers’ Union on the Trades Council. William Morris visited Aberdeen in 1888, speaking to an audience of around 200 in the small hall of St. Katherine’s and presided over by Webster. Morris described his audience as “lukewarm” and felt that the development of socialism in Aberdeen was “held down by local Radicalism”. Mahon himself was very much of the opinion of H. H. Champion in the SDF that agitation should be centred primarily on agitation around the eight hours day and that the struggle for socialism should be subordinated to this. Champion and Mahon both had an influence on the Aberdeen Socialist Society in this matter but it was interpreted in different ways by the different bodies of opinion with in it. So the social democratic faction argued for legislation, whereas anti-parliamentarians like Duncan called for it to be won by the general strike. Aberdeen Trades Council was the first such body to declare for a legislative eight hour day in August 1889 and the following year spoke on the eight hour day at the biggest such rally in the UK outside of London on May 17th, with 10,000 attending. The debate about how to win the eight hours continued with Duncan arguing his corner against W. Cooper who supported legislative action at an indoor meeting in November 1890. The Socialist Society carried out intense agitation in Aberdeen through weekly open air meetings at Castle and many indoor meetings. Duncan often spoke at these events. Duncan and others in the Society were musical enthusiasts and a choir was organised that sang at both outdoor and indoor meetings (this was common throughout the Socialist League and other bodies at the time, e.g. the example of Yarmouth). The branch produced a booklet entitled Socialist Songs in 1889. Anarchist ideas began to spread rapidly in the Aberdeen Socialist Society. For example “at our meeting on Sunday July 6th, 1890 a comrade who is a declared anarchist, lectured on “anarchy” to a large audience. There was a brisk discussion, opinion being about equally divided between anarchy and state socialism; comrade Aitken declared that no hard-and-fast line could be drawn between anarchy and the socialism of the League”1. Later in the year, on Oct 5th there was an evening discussion on Russian anarchist Peter Kropotkin’s Scientific Basis of Anarchism. The disagreements between supporters of the reformist and revolutionary lines worsened. It seems from reading between the lines that this crippled the annual conference of the branch in summer 1890: “As very little was done”2. A split in the ranks of the Aberdeen Socialist Society a few months ago, gave birth to a Revolutionary Socialist and Anarchist organisation called the Aberdeen Revolutionary Socialist Federation. The Federation has had a fair amount of success, large crowds assembling in Castle Street on Sunday evening to hear Comrades Addie and Duncan, to whom they give an attentive hearing. At the start of the Federation Duncan was the only outdoor speaker, but Addie has dared and done great things - his manipulation of figures being a source of great information to his listeners. The Propaganda of the Revolution has, it would appear, something in it that "canny" Aberdonians like. Perhaps politicians have so often cheated him that he will turn to Revolution for his salvation at last. The Federation is slowly but steadily increasing its membership, and though we have not got a long list of members the energy and activity of those who are members is steadily increasing. We went to Stonehaven last Saturday, a small town about fourteen miles south of Aberdeen, to see if we could spread the light any more, and we got a surprise instead, and after we had sung the "Marseillaise" and two other songs, and Duncan speaking to an audience of about fifty children, one fisherman, and two swells from Aberdeen, for about five minutes, a crowd began to gather, and inside of a quarter of an hour, we had what an old man said was the biggest crowd he had ever seen in the square. The crowd appeared to appreciate Duncan's heavy blows at the landlords, capitalists, and sky pilots, and when he finished he was loudly applauded. We have promised to go back in three weeks and carry on the work now begun. This run into the country has given us hope that there is life amongst the agricultural labourers yet, and it only requires a little hard work on the part of Socialists and Anarchists to make them really alive to their position. Aberdeen is now about half mad concerning Champion, and in Labour circles the question, being discussed with a vigour worthy of a better subject, is whether Champion is a fit representative for South Aberdeen or not. The Federation has done its level best to show Champion in his true colours, and to keep the workers from putting their trust in him or any other would be politician. Shortly after the formation of the first Socialist Society in Aberdeen we were favoured with a visit from Comrade Morris, reviewing that visit our Comrade said that he did not think the Socialist movement likely to make great progress here, because of the strong radical element existent in our midst. This enraged Comrade Leatham and a war of words ensued; whatever may have been our opinion then, as to whether, or not, the radical element was calculated to interfere with our progress, there cannot now remain any “possible, probable, shadow of doubt ", and we can now see that Comrade Morris spoke with his characteristic wisdom. We have recently been favoured with their programme, which contains the following "revolutionary" measures; a complete inspection of the Gas Works, and an 8 hours day for municipal employees. The Community to take over the liquor traffic, the profit to be devoted to the building of artisans’ dwellings. Doubtless our late Comrades can deal with the two last mentioned parts of their programme effectively. But we fail to see what claim any propagating such ideas can have to be called Socialist. However we may leave for the meantime, their miserable tinkering to the tender mercies of the "majority". Further hostility arose over a demonstration organised around the land question by the Socialist Society. The Revolutionary Socialist Federation was invited to attend. They agreed to do so provided that they were allowed to express their own views on the subject. As described in Commonweal by Duncan (Sept 17th, 1891) “…we had a beautiful banner bearing the inscriptions "Revolutionary Socialism "on one side and "No Master" on the other.” There was also a fish cart done up as a gibbet with a dummy wearing a top hat with a monocle in one eye, symbolising capitalism. The cart was festooned with placards saying "Dynamite the social sore", "Speed the Revolution", "Vive la Commune", "Damn the British Constitution", "All wealth to labour doth belong", "We'll turn things upside down", etc. Leatham turned up and said that Hyndman would not speak if these slogans continued to be displayed. On refusal Leatham set off to fetch two policemen. Eventually it was agreed to take the placards down and the demonstration set off. Duncan went on to say that: “This will serve as a specimen of the doings of the Social Democrats in Aberdeen, it shows how men will betray the cause because of the hope of getting into Town Councils etc., and certainly shows that Social Democracy means " the Coming Slavery ", we will therefore continue to show that it is far from being "The only thing that will do"." A glimpse into the life of the group can be seen from a report of the annual social meeting on a Saturday evening in the Aberdeen Evening Express for November 14th, 1892. There were songs from A. Fraser, A. Smith, H.Duncan, G. Fraser and G. Horne, followed by readings by James Taylor and James McFarlane. A. Smith accompanied on the cello and the proceedings began and ended with a communal singing of William Morris’s song ‘No Master’, followed by a dance. In solidarity with the editors of Commonweal, Charlie Mowbray and Nicoll, the group held a large meeting on Sunday April 24th where Commonweal was completely sold out. Agnes Henry spoke to the Group on 27th February on The Independent Labour Party and State Socialists to a large crowd and “a number of Socialist Songs” were sung. This was followed on March 19th by a meeting on Should Working Men support the ILP? With Duncan and James Horne speaking against to a “very large crowd”. The group continued their rounds of meetings throughout 1894 with a demonstration on Sunday 6th May in Castle Street. George Fraser was the first speaker, followed by Duncan who advocated the general strike and solidarity. He was followed by Burgoyne down from Inverness who gave a long speech deploring the fact that British workers had no distinct historical past and that it only required workers to recognise their wrongs to do away with them. He was followed by Henry from Edinburgh who attacked the Independent Labour Party and State Socialism. As usual, a number of socialist songs were sung. James Tochatti up from London spoke in the Oddfellows’ Large Hall on Human Nature and Anarchism on Sunday October 1st and on the following day in the Small Hall on Economic Conditions and Anarchism 3. The Aberdeen Anarchist Communist Group hosted the third conference of Scottish anarchists on January 1st 1895. It was held at the Group Club in Seamount Place. Duncan welcomed the delegates from Dundee, Edinburgh, Glasgow, Hamilton and Motherwell. Shepherd gave an account of the movement in Aberdeen, which had a membership of 100, with sympathisers “not less than one thousand” and asserted that the anarchists were the greatest socialist force in the city. That year was also marked by an intensive amnesty campaign in favour of the framed Walsall anarchists. The anarchists buried their differences with the SDF enough to hold a joint demonstration around this in Aberdeen. Duncan initiated the setting up of the Scottish Sea Fishers’ Union. He was successively President of the Trades Council, joined the School Board, and later supported W. Middleton, the Labour candidature at the 1909 Stonehaven municipal election, himself then becoming a Labour councillor in Aberdeen. Later on he held a post on the staff of the Education Authority, finally retiring when education affairs were taken over by the Council. He died at Mornington Hospital in May 1937 at the age of 75. An indication of the change in Duncan can be seen by the speech on the subject The Working Man: His Rights and Responsibilities, reported in the Aberdeen Journal of 18th February 1920 where he stated that “Instead of a revolution, what was needed was a reformation, starting from within each man”. He went on to say that, as a Christian, he would have been a conscientious objector in the recent World War. Duncan had eventually taken the road that he and the other Aberdeen anarchists had so bitterly criticised Leatham for. The once vital anarchist movement in Aberdeen was a thing of the past. Obituary of Duncan in Aberdeen Journal, 5th May 1937.